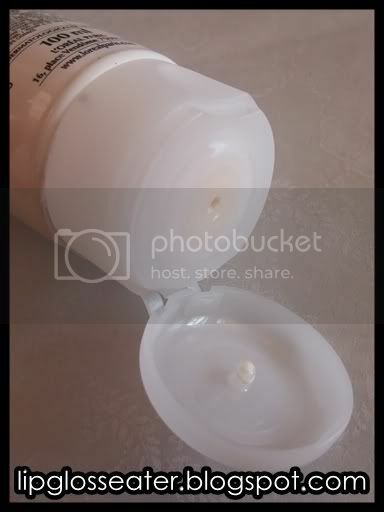 Ingredients: Aqua / Water, Octocrylene, Glycerin, Alcohol Denat, Propylene Glycol, C12-15 Alkyl Benzoate, Drometrizole Trisiloxane, Cyclohexasiloxane, Cyclopentasiloxane, Butyl Methoxydibenzoylmethane, Exthylhexyl Triazone, Titanium Dioxide, Ethylhexylgrycerin, Triethanolamine, Acrylates/C10-30 Alkyl Acrylate Crosspolymer, Dimethiconol, PEG/PPG-18/18 Dimethicone, Glycine Soja / Soybean Oil, Tocopherol, Pentasodium Ethylenediamine Tetramethylene Phosphonate, Aluminium Hydroxide, Stearic Acid, Vitreoscilla Ferment, Limonene, Linalool, CI15985 / Yellow 6, CI16035 / Red 40, Parfum / Fragrance. 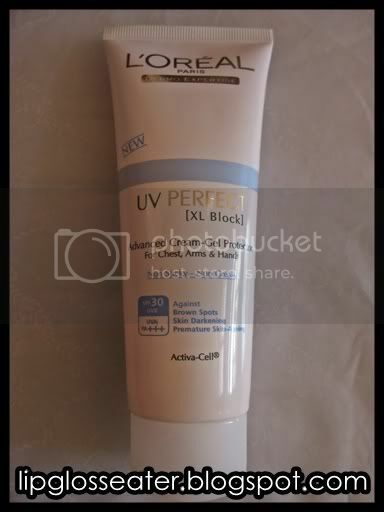 To better protect skin against outside and inside aggressions, and prevent premature skin-aging, Loreal Paris introduces UV Perfect Advanced Cream-Gel Protector. Advanced UVB / UVA protection reinforced against UVA, thanks to it patented filtering system [XL Black]: with Mexoryl® SX and XL. UV PERFECT contains Activa-Cell®, a patented anti-oxidant with a proven action on the natural repairing system of the skin. 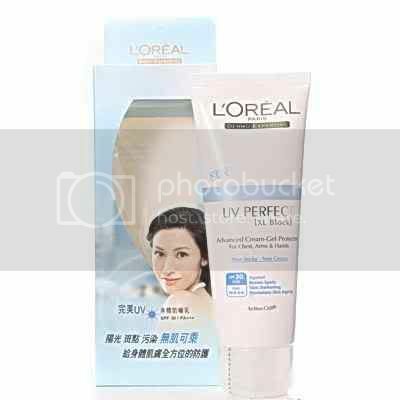 It ensures an optimal protection against free radicals and fights from inside against photo-ageing, drying. - Hydrated and smoothed, your skin stays fair and young looking. 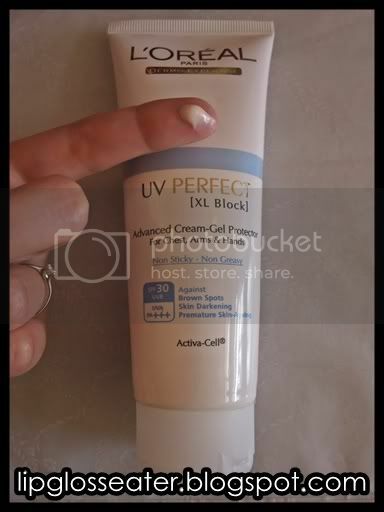 This sunblock does live up to it's non sticky, non greasy claim (probably due to the Alcohol Denat in it!)! it goes on smoothly without the sickening sticky feeling some sunblocks give! It does not leave a whitish cast behind too! It has a rather strong, but pleasant perfumy scent. It takes under a minute for this sunblock to be absorbed fully. Like all sunblocks this needs to be reapplied every 3-4 hours for maximum protection! I kept this in my office drawer to use during my lunch break (when i have to walk rather far to the office car park under the sun!!). It's great for protecting your arms while driving too! Gripes: Contains alcohol denat! Not really a gripe, but a SPF50 and above version would be great!! Rating: ! 4 Stars! Me Likey!